"For over 60 years, Hipoglós has been a staple in every family’s home in Latin America. 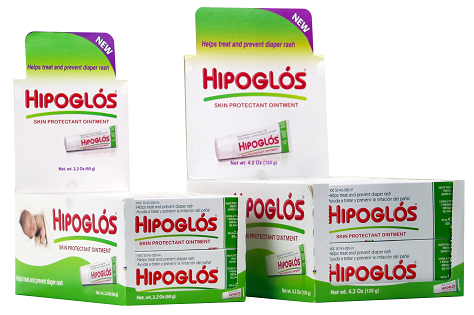 Hipoglós ointment helps treat and prevent diaper rash. It protects chafed skin, helps seal out wetness, and provides relief from the very first use. Hipoglós nourishes and regenerates skin and creates a protective barrier against possible skin irritation. For more than 60 years it has been a diaper bag essential. Parents living abroad have been asking for Hipoglós from friends and families living in Latin America. Now everyone can enjoy using Hipoglós across the USA. Including celebrities!"" I was sent a 2.2 oz tube of Hipoglós to review. The price for this tube is $4.99. You can also purchase the larger size (4.2 oz) for $6.99. On Amazon right now, it's $8.99 from a third party store. This is sold both on Amazon and in select Walgreen’s stores. This tube of Hipoglós arrived to my house in perfect condition. It was shipped inside of a box, and the box was a little damaged, but not the tube. The tube is white with green and red accents. There is a lot of information on the tube, so read it carefully. The front and back of the box are exactly the same. They label the product, brand, and sizing information. The information is both written in English and Español. The right side of the box has all of the drug facts listed as well as the uses, directions, warnings, storage information, and other ingredients. The left side of the box provides the manufacturer’s and distributor’s information, copyright, and UPC. Both ends are a little different. The bottom labels the batch number and expiration date. The top is identifies the product plus tamper information. The tube itself is identical in theme and information. The batch number and expiration date are also stamped into the top of the tube as well in case you toss the box. There is a foil safety seal underneath the cap, so make sure you peel this off before use! I cannot even begin to tell you how many different diaper rash ointments that I have been through. I have tried so many that I can’t even recall all of the names of them. The one that I most recently used was from ‘Grandma’s’, and it was in tub form. Although the formulation was good, I hated that it was in a tub, so I am glad to be back to a ‘tube’ now. First, I want to explain its consistency. It's definitely a creamy ointment. It is tan, but has a strong fragrance. It's a very soft cream, and it spreads easily and coats well. This is definitely a staple around here now. It really works great. It’s a little strong smelling, but it is a small price to pay for a diaper rash ointment that works fast and is powerful without being harsh. The cream is very soft and spreads evenly and coats well. Works great on first signs of diaper rash. Used and trusted in Latin America for over 60 years! Seals out wetness, so it prevents diaper rash as well as treating it. When you are a parent, you quickly find out that you don’t want to mess around with things that ‘might’ work. You want it to work right then, and to actually work. Usually, products that are efficient and convenient cost a little bit more. In this case, you have a very, very effective product that is extremely affordable. I love this diaper rash ointment, and it’s the only one I will be using while my daughter is still in diapers. Are you wanting to get your very own Hipoglós Skin Protectant Ointment?